Graeme and Lisa Wharton, from Sunderland, have been named Slimming World's Couple of the Year after losing more than 10 stone between them. They are now both the lightest they have been in their adult lives after trading a diet of white bread rolls, crisps, chocolate and frozen ready meals with chips for healthier alternatives including eggs, fruit and plenty of vegetables. 41 year old Lisa, said the couple struggled with their weight since they were teenagers. "My family always described me as 'from good stock' or 'big-boned' and Graeme was just told he had 'puppy fat' so neither of us worried too much about our size. The couple met in 1989 when Lisa was 16 and Graeme was 17. They married five years later and had two children - Jack, now 18, and Alice, now 15. 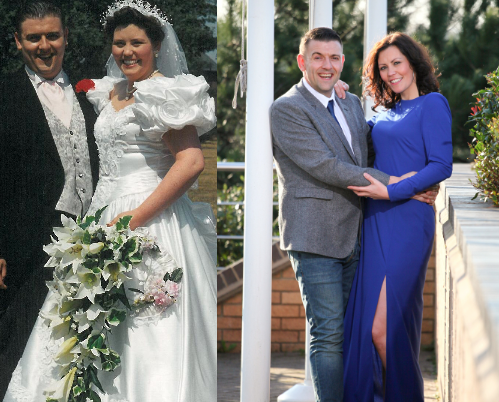 "I wore a size 18 dress on our wedding day and Graeme's suit had a 48 inch waist. Mrs Wharton joined Slimming World in 2006 and lost 4st 7lbs but stopped attending the weekly group because of new work commitments. She rejoined in January last year and her husband decided to accompany her. "The turning point for me came on Christmas Day 2012. We got dressed up for dinner, put our gladrags on as you do, but I felt so uncomfortable in my smart trousers and shirt because they were tight and I felt like I was spilling out over my trousers. I ended up going home to put my joggers on and that's when I knew I needed to do something. Graeme's lost 5st 6lbs, dropping from 19st 10lbs, and his waist has slimmed from 48 inches to 34 inches. Lisa lost 4st 12lbs from her original weight of 15st 61/2lbs, dropping from an 18-20 dress size to a 12. The couple also took up walking, which progressed to running, and Mrs Wharton also joined a local bootcamp class. They have both signed up for the Great North Run in September, with Mr Wharton fundraising for Meningitis Now and Mrs Wharton running for Sunderland AFC's The Foundation of Light.